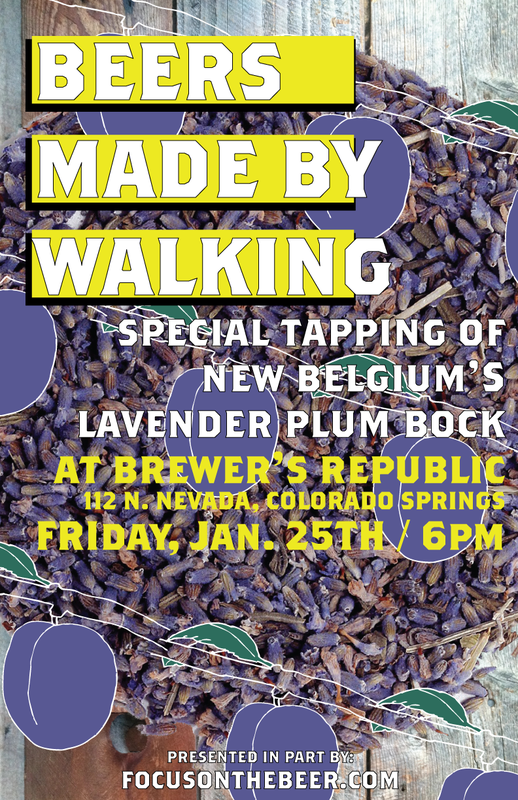 We are very pleased to announce that we were able to secure a keg of New Belgium’s Beers Made By Walking beer. We thought this was a good enough reason to celebrate so we have coordinated with Brewer’s Republic to tap it later this month. Last year we invited New Belgium to be a part of our BMBW program. They went on a walk around their property and identified plants in the area. They decided to use lavender and plum in a bock. Not only that, they invited us to come up to Fort Collins and help brew it with them. The beer has only been on tap in their brewery taproom and it was also available during our Anniversary Party. We have one more keg of it and would like to give you all another opportunity to have some. The beer turned out lovely. It’s a 5.5% amber with subtle and delicate malt notes. The lavender is present but not overwhelming in any way and the plum contributes some nice residual sugars for an extra layer of complexity. This may be your last opportunity to try this beer so we hope to see you there.